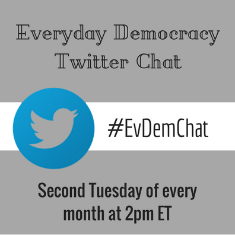 Everyday Democracy hosts a Twitter chat the second Tuesday of every month at 2pm ET. This month's Twitter chat will highlight the work of young leaders organizing and creating change in their communities. Join us this month for a great discussion!